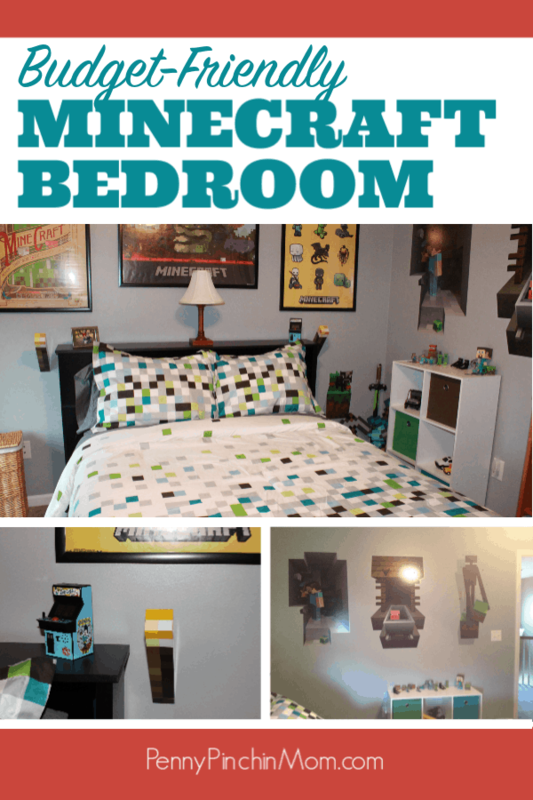 If your child is into Minecraft, then he or she will want to get this Minecraft bedroom! You can recreate this same look — even on a budget! As most kids which games they like to play and you’ll hear Minecraft. There is something about this app that pulls kids in and encourages them to be creative. Your kids can take this play offline and live in their own Minecraft world! 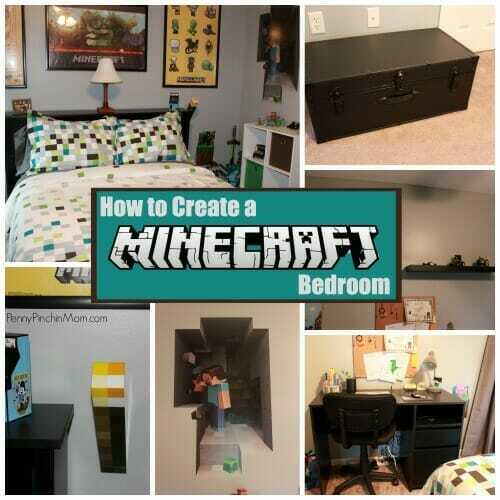 Pull together Minecraft decorations and bedding and transform their room into one that takes them inside of the game. You don’t need to spend a lot to recreate this Minecraft room for your kids. But, if I do recommend you save your cash and do it (no reason to go into debt doing so). The main focal point for the room will be the bed. 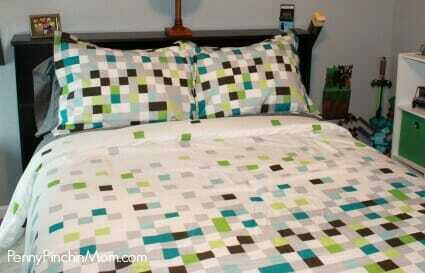 You’ll want to find some type of checkered or patterned bedding that mimics the look of the Minecraft bricks. The set pictured above is no longer available for purchase from Overstock (it is from 2014), but you can find similar styles through various retailers. The idea is to find something in this style to make a look. For example, you can find a fun red and grey block style set from Amazon, for less than $70. It gives you the Minecraft feel but is still very budget friendly. While you can purchase bedding that shows the Minecraft logo and characters, I would think twice. By finding something that is basic, you can get more life out of it. In a few years, when your child no longer wants a Minecraft room, you can simply remove the wall decor and the room will lose the Minecraft appeal. However, if you buy bedding with creepers and other characters on it, you will need to replace it. That can eat into your budget. Stick with simple bedding that will stand the test of time. Adding the decorations to the wall is going to be the most fun. There is so much you can do! You may want to use Minecraft Posters and Decals. Not only are they affordable, but there are also countless styles and colors you can choose from. If you want to bring a 3-D effect to the room, add a couple of light up Minecraft torches to the wall! Yes – they really DO light up! They make a fun nightlight while keeping with the overall theme and feel on the room. (If you don’t want to mount them to your wall, you can place them on a desk, nightstand or headboard as they do stand upright). Let’s face it. Kids need storage. They have toys, games, books — all sorts of things. And, as a parent, you want their room to be a fun place to hang out, but not messy. There are a couple of easy storage ideas you can add to your room. We started with a black footlocker. It really had the look we wanted for the room but was completely functional. It was a bit more expensive, but it is an item that will far outlive his youth. Once he no longer needs it for toys, it can be used to store other items such as blankets or other items. And, even if he doesn’t want it in his room, it can be used to store just about anything in your house. Another easy thing to add is cubicle storage. Pick up a white or black storage cube. Then, find colored cubes that match those in the room. While the bins serve as storage, they also give the look of stacked bricks — which really drives home that Minecraft feel. Any furniture really works to pull together the look. However, using a black headboard creates a finished look. Fortunately, headboards can be relatively inexpensive through sites such as Wayfair. An investment in furniture at a young age can grow with a child as he or she gets older. If your child needs to do homework in his or her room, don’t forget the desk! You can find furniture on sale and use a coupon at Target. Check the Cartwheel app for the most recent offers. You may also find them for sale on sites such as Facebook Marketplace, Lets Go or Craigslist. Sometimes, used furniture is just as good as new – at a fraction of the cost. We opted for a soft grey in order to complement the white trim. It not only blended with the bedding and decor, but it is also neutral. So, if he changes his mind in a few years and wants different bedding, we will not have to spend the time (or money) having to repaint his walls. Here is a pro tip! Watch for a sale on paint at your local hardware store. Buy it then – untinted and save the receipt. When you are ready to start your project, take it back in and they will tint it for you – at no charge! You can often save as much as 40% off the purchase of paint for your room. Creating a Minecraft room on a budget is possible. You just need to watch the sales and plan accordingly. Before you know it, your child will have the room of his or her dreams.